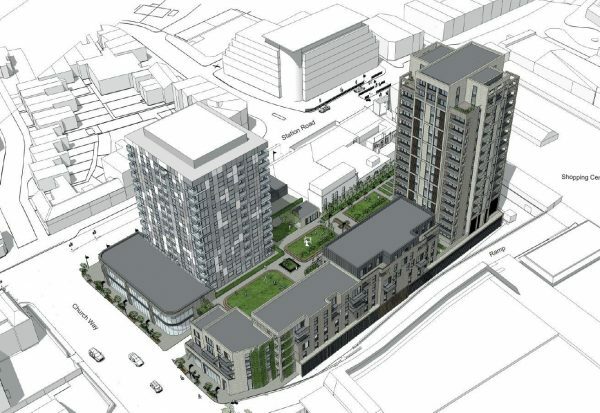 Infrastructure enablement works have commenced on a major £27m residential and retail scheme on Station Road Edgware, London, paving the way for full development works later this year. Originally the site of Edgware railway station and associated loading yards built in 1867, the development known as Premier Place will deliver new residential and retail accommodation with car park alongside the existing Broadwalk Shopping Centre. Designed by The Harris Partnership for PDR Construction and end-user Network Homes, the scheme comprises 124 private and affordable flats over four blocks, the highest of which is 17 storeys incorporating a cruciform layout to the upper storeys and open balconies, with the lowest being four storey and incorporating retail at ground floor. With an elevational treatment in a mix of brickwork and natural zinc, the scheme has a central focus landscaped podium with allotments and children’s play areas, and car parking below, both providing new pedestrian links to Station Road. The development, which is entirely brownfield regeneration surrounded by existing high street retail, service roads and ramps to the existing shopping centre, will be handed over in phases over a two year build period.